"It's almost like seeing a guy show up at the soup kitchen in high hat and tuxedo. It kind of makes you a little bit suspicious. Couldn't you all have downgraded to first class or jet- pooled or something to get here? It would have at least sent a message that you do get it." "Maybe you can tell us what you're actually going to do to sell cars people want. Somebody heard that we're giving out free money in Washington. They're showing up from all over the place. But you don't want to put your last tourniquet on a dead guy." You go, Gary! Every once in a while, an elected official speaks the truth. Rep. Ackerman's concise, populist critique of American fat cats underscores the abject hypocrisy inherent in all these economic bailouts. Somehow, the rich stay rich or get even richer while everyone else heads to hell in the proverbial handbasket. 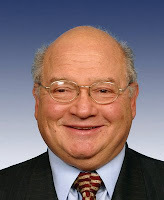 I'm so pleased with Rep. Ackerman that I'd give him my last tourniquet even if ready to gasp his last breath. We need more people like Ackerman looking out for us - and speaking the God's honest truth. Thank you, sir.